From Eden we come… To Eden we shall return. Spacious burial and cremation repository sites, banning of expensive vaults and toxic embalming chemicals, and insistence that caskets be made of wood or other biodegradable materials. We can also assist in locating such affordable caskets (costing as low as a few hundred dollars rather than thousands), or cremation urns made of wood or clay. You can also use shrouds woven from cotton or wool, or you can even use a favorite blanket or quilt. Appropriate markers can be uncut natural stone, or a native tree, shrub, or flower. Any or all the above ensure that the burial site itself becomes a living memorial and a testament to your personal values. While we do not direct funerals, we will be happy to work with you or your family if you want to bury your loved one yourselves. We can also work with your mortician regarding arrangements and requirements for burial in the preserve. If your family or mortician is uncomfortable working with a traditional burial, we can help you find a consultant to assist you. You may also scatter ashes at Glendale Memorial Nature Preserve, or bury beloved pets in your family plot. Eighty percent — the best and wildest part of Glendale’s 350 acres, located in Florida’s panhandle area — will remain forever wild and free of development. Only trails and boardwalks have been added to allow you access to burial sites or to explore the natural beauty of the longleaf pine-wiregrass ecosystem. 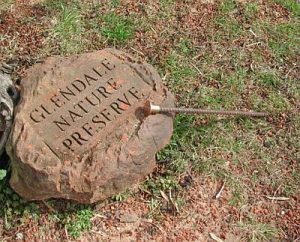 Glendale Nature Preserve Inc. is a tax exempt (I.R.S. 501 (c) (13) non-profit organization chartered in 2002. Because we care deeply about saving land, we set aside 25 percent of gross receipts for preserve restoration, perpetual stewardship, and other conservation activities. 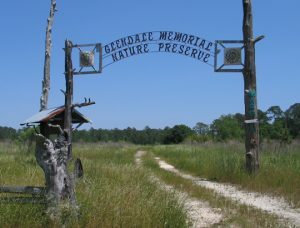 We also help promote memorial preserves in other regions of the country, and are affiliated with Memorial Ecosystems. 1. We need the name, and dates of birth and death, for markers. a: The “burial transit permit” (if death occurs in Florida). b: Death Certificate (if death occurs outside of Florida). If a gravestone is desired, a flat natural stone, max. 4 sq. ft. (2 ft. x 2 ft.) is acceptable and can be inscribed. To help maintain the natural fauna and flora on the preserve: artificial flowers, vases, or any other decorations placed on gravesites will be removed. Payment can be made with cash, bank cashier’s check or money order. Monetary contributions to the GMNP Cemetery Fund are always greatly appreciated. CASKETS: Caskets are not required, however are available from Glendale Enterprises for humans and pets. A custom-cut sawmill is adjacent to the nature preserve and generously shares with our non-profit cemetery some of their heavy machinery and even part of their office. An early supporter of the green cemetery movement, they create hand-crafted caskets and other gravesite goods during the off-season, which they produce at cost or near cost. 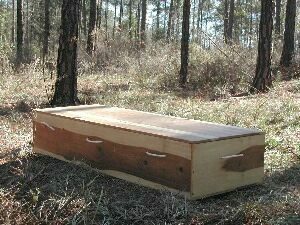 They will also stop to make custom or unusual sized caskets whenever needed. While you are here at the nature preserve, feel free to visit the bamboo groves. MARKERS: Brass (depicted middle-right) and aluminum survey markers, driven into the ground, are one of the ways we use to mark a grave at Glendale Memorial Nature Preserve. Brass at the head end of the grave and aluminum at the foot. You may include a V.A. or other marker. A native stone is another possibility. We limit stone size to 4 square feet and it must be placed flat on the earth. It would normally be engraved with the decedent’s name, date of birth, and date of death. In addition we are developing a GIS/GPS system for family plot and individual grave site identification and mapping. Interested in getting a tour of the Preserve? Give us a call at 850-859-2141.